Making rapid headways in the overall polymers and advanced materials industry, pressure sensitive labels market has continued to garner immense popularity as one of the most lucrative business verticals of this decade. Owing to their superior bonding properties and ease of application, pressure sensitive labels have found enormous usage as masking, sealing, and labeling material across variegated industries. This includes general manufacturing, healthcare, logistics, automotive & transportation, and food & beverage, among others. As a consequence of its widespread utilization, these materials are gradually replacing traditional bonding elements and techniques in the manufacturing procedures of the aforementioned businesses – a factor that has significantly boosted the commercialization potential of pressure sensitive labels market. In addition to this, numerous established market players have been undertaking various research activities in order to revamp the existing product portfolio and develop unique tapes and labels to remain competitive in this highly combative business space. According to a report by Global Market Insights, Inc., the worldwide pressure sensitive tapes & labels market commanded a total valuation of over USD 90 billion in the year 2016, which explains the rising significance of these materials across various end-use domains. Over the recent years, it has been observed that the leading pressure sensitive tapes & labels industry participants have been engaging in research activities and pouring in massive resources to unveil state-of-the-art products. For instance, the American conglomerate 3M has recently introduced a new pressure sensitive tape named as 3M™ FWBT (Fire and Water Barrier Tape). The latest tape has been reportedly designed especially for firestopping in construction and is said to be integrated with the advanced pressure sensitive adhesives. Consequentially, this has lent the new tape an increased credibility as it would be applicable to an extensive range of construction substrates both at low as well as high temperatures. Furthermore, FWBT is being claimed by pressure sensitive labels market experts to be first of its kind material that encompasses self-adhered membranes which are known to provide an elastomeric tough seal. Apparently, the launch of such innovative products would bring about drastic altercations in the growth dynamics of the overall pressure sensitive labels market in the forthcoming years, claim industry analysts. In a bid to fortify its stance in the North America pressure sensitive labels market, Tokyo headquartered adhesive products manufacturer Lintec Corporation has officially announced to have acquired Mactac Americas L.L.C at an estimated cost of around USD 375 million. Industry experts have understandably concluded that the latest acquisition is of colossal importance for Lintec, as it is likely to bring about a transformation of sorts in the existing range of products in the pressure sensitive tapes & labels industry. One of the major factors to cause this change is the high-speed coating technology and excellent adhesion formula deployed by Mactac while developing its tapes and labels, which would be added to Lintec’s product portfolio. Moreover, it would be imperative to mention that the products of the Ohio based firm are being extensively used in graphic design, label printing, automotive assembly, retail display, digital imaging, medical device assembly, fleet graphics, packaging, and assembly engineering. Subsequently, this wide scale applicability of Mactac’s products would assist Lintec to extend its reach across all-inclusive business verticals. Apparently, the aforementioned instances go on to explain the primary reasons behind North America being one of the largest growth avenues for pressure sensitive tapes & labels industry. Apart from the rising number of takeovers being witnessed across this business sphere, the major pressure sensitive labels market giants have been concentrating on enlarging their manufacturing scope in geographical terms. To serve the swiftly progressing South America pressure sensitive tapes & labels industry, UPM Raflatac has recently inaugurated a new labelstock slitting and distribution terminal in Chile. The latest terminal would reportedly offer a new range of sustainable and advanced labels to the consumers in the wine and craft beverage segments in Chile and its neighboring countries including, Bolivia, Argentina, Peru, and Paraguay. Needless to say, such bold initiatives being executed by prominent industry players to expand their sphere of influence across the globe would augur well for the overall pressure sensitive labels market share augmentation. With concerns related to emission level, life cycle analysis, performance, and sustainability of these labels and tapes, the major market participants have been prompted to come up with viable alternatives like hot melt pressure sensitive tapes. 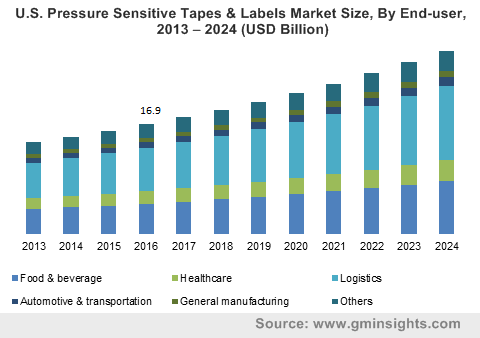 With an ever-increasing requirement for these materials coupled with a favorable regulatory framework, pressure sensitive tapes & labels market is projected to surpass a striking remuneration portfolio of about USD 150 billion by 2024.